For nearly 50 years there flourished in Pinewood Road a mission hall, originally called Pinewood Mission Hall, built in 1936 of asbestos and timber by Sidney William Freeman, an Ash resident and local businessman. The site cost £60 and the building £50. An extension was added between 1942 and 1944 at a cost of about £350. Sidney, the son of a Methodist Circuit Preacher, and other families saw the need for a mission hall to serve the area around Pinewood Road and Wyke Avenue. Later the name of the hall was changed to Gospel Hall. During World War II, Connie Azzopardi played the organ for the services and her mother, Gladys, played it for the Women's Guild started by Sidney's wife Florence, the Guild's President. The hall was not registered as a "building for public worship" until 1980. On 27 June 1980, Tom Hall from Aldershot Park Hall conducted the marriage of Alan Bell to Anne Catherine Clarke, the daughter of Ken Clarke, the Lay Preacher of the Gospel Hall at that time. It was the only marriage conducted at the hall. Services and Sunday school were held regularly and from the beginning were well attended with a peak about 1970 but by early 1980 numbers had declined to only three to four families attending Sunday service. 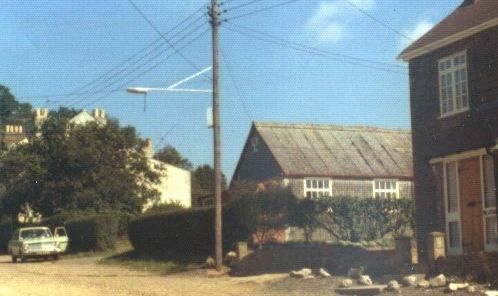 The hall was closed and in 1986 it was decided to sell the site. The Counties Evangelistic Society benefited by £35,000 from the sale of the land on which three new houses now stand.